I'm having a hard time getting back to making cards now that I'm home. We were in California for the past week visiting Dean's oldest son and his family. It had been a couple years. Anyway, we had a blast seeing them and did get to play a bit of tourist while there. Mike, his wife Amy, and our youngest granddaughter Rowan took us to the Hearst Castle! WOW! I have oodles of photos on my little Canon camera and do have them downloaded to my computer but that's it. I'll share some of them later. But I was over on Pinterest looking at some ideas and thought I should get started on my card class for September. 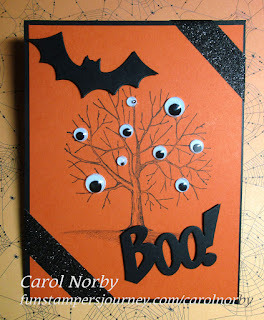 Will be doing Halloween cards and did order some dies to go with a fun set of ghosts stamp set. Should have that order in about a week. But here's a card inspired by one I seen. The cool tree is from a Host Benefit set (can earn it with a $600 party) called Family Forever. It has 23 stamps! 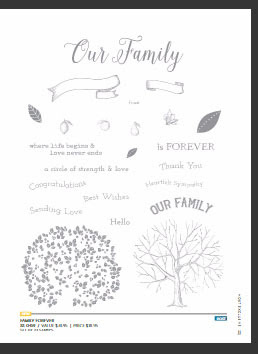 I'll have to make some more cards using this cool set and it does not come up so I took a screen shot of it from our online catalog. I have to admit, the picture is small. 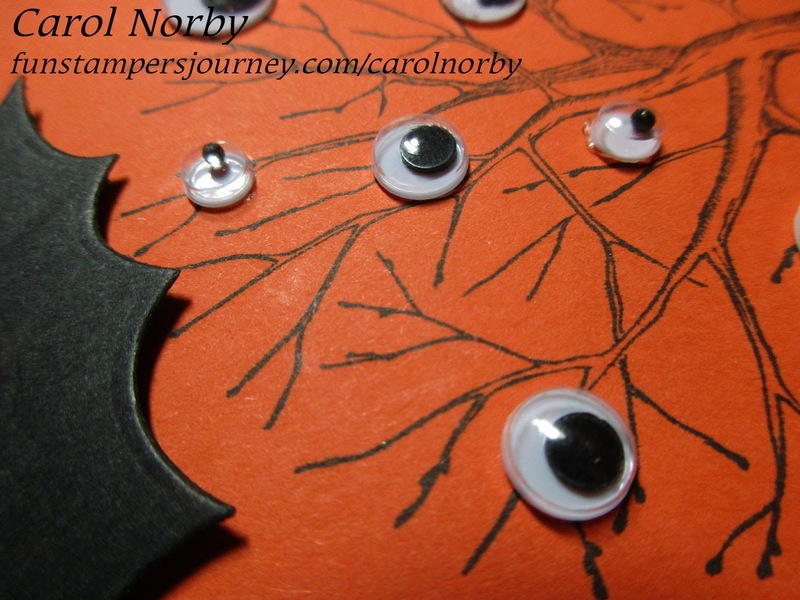 I started with a base of Black Licorice card stock then layered a smaller piece of Tangerine Fusion card stock. I stamped the tree using Black Licorice ink and made a bit of ground under it using the Black pencil from our Color Burst set. I added some Licorice Sparkle Tape to 2 corners. 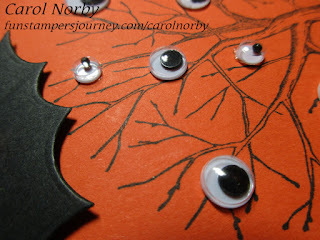 The die cut Black Licorice Bat and Boo die cuts are part of the Snapshot Frames die set. (One of my favorite die sets!) I added some Wiggle Eyes to the tree and ta da! Other products used are glue dots, foam squares, Easy Glide Runner, and the Amaze machine. What a hoot! I love how this turned out! Okay, 1 card down and 3 to go!